This is one of the great recordings of the Second Symphony of Sibelius, and it's something of a mystery as to why it's not been reissued before. We are grateful to ardent Sibelius enthusiast John J Davis for the loan of his LP for this transfer - of his collection 37 recordings of the work this is the only one he rates amongst his personal favourites which has remained stuck in the LP era. ...the recorded quality of the new Parlophone disc is exceptionally good, with an emphasis, in loud moments as well as soft, on clarity. In the case of the timpani there is in fact greater clarity than I can recall ever hearing on disc before, considerably greater than is often the case in the concert hall. The note tells, at whatever dynamic level it may be played ; and its pitch (an infallible one : the Hamburg player is a first-class timpanist) sings out miraculously. Thus the new timpani part to the end of the finale is doubly effective (had this revision, now often heard, Sibelius's authority? *—I do not know, and would much like to) ; and the slow movement, too, gains in many passages. The opening of this movement gains also from the care taken by the 'cellos and basses to avoid using open strings in the pizzicato passages. This is only symptomatic of the extreme care in performance that has been taken throughout ; and the result is rewarding. Schmidt-Isserstedt for much of the time concentrates on the spaciousness of the music rather than its impulse ; and this might conceivably be held to rob the first movement, and perhaps the finale too, of some small degree of their potential excitement. But the Scherzo is as exciting as can be ; and in any event the view taken of the symphony is an eminently reasonable one. I'm pleased to report that, with XR remastering and the judicious use of Ambient Stereo processing (optional) this 'exceptionally good' sound quality is further improved - although the original production by legendary Decca producer John Culshaw (who worked on a series of recordings for Capitol in 1956-7) was certainly of the highest quality for its day, a certain constriction in the broad strings of this work is clearly evident when played alongside this newly remastered version, and overall the orchestral sound is more fully rounded throughout. The Second Symphony was one of my first introductions to the music of Sibelius in my early teens and made a great impression on me then. The present recording serves as an excellent reminder of why I enjoy this work so much - highly recommended in every respect. 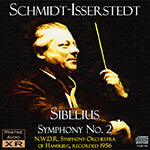 It also persuaded me to listen again to what is currently the only other recording offered by Pristine that was conducted by Schmidt-Isserstedt - the 1937 Kulenkampff/BPO world première recording of Schumann's Violin Concerto (PASC004) which was among the twelve recordings that constituted our entire catalogue when we launched in February 2005 - if you've not heard it I'd strongly recommend giving it a listen! "In the recordings conducted by Serge Koussevitzky (1935 and 1950) there are audible additional Timp. tones, and in Sibelius’s Handexemplar of the study score (PB 3323, in Ainola), the composer pencilled in bb. 359, 363, 365, and 369 in his later years at 1/2 quarter notes G and d, which may refer to Koussevitzky’s additions. However, Sibelius did not accept Koussevitzky’s additions, as can be deduced from conductor Eric Woodward’s answer to the composer’s letter (Woodward’s letter dated 20 December, 1946; National Archives of Finland, Sibelius Family Archive, file box 32; Sibelius’s letter has not been preserved), and Woodward’s letter to Koussevitzky (dated 16 June, 1950; Library of Congress, Koussevitzky Archive, 56:16). No Finnish conductor contemporary to Sibelius adopted these additions. I hope this will make it a little bit clearer. Unfortunately, there are such "traditions" which are followed by conductors without any real evidence whether they come from the composer or not. Kari Kilpeläinen. [Editor, Sibelius Edition]"
Timo Virtanen, Jean Sibelius Complete Works"